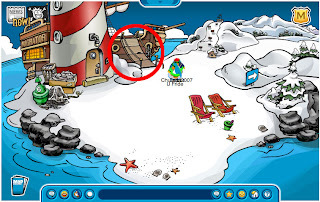 HINT: Find the Club Penguin 4th of July Fireworks! 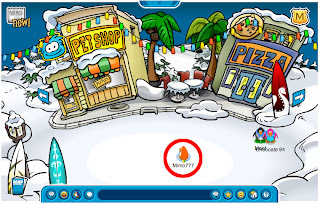 Here is how you find the Club Penguin fireworks. They are located in two different places. 1. Click on the Map icon in the lower left. 2. Click on the Iceberg or the Mountain. 3. Oh, say can you see! Wait 20 or 30 seconds and they'll really light up the sky. 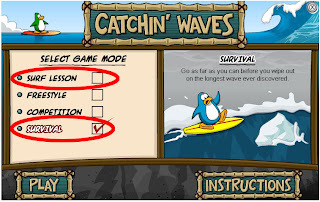 HINT: New "Catchin' Waves" Surf Lessons & Survival! 1. You can now take Surf Lessons! Follow the arrow with your mouse, read the tips, and learn out to play. 2. Play Survival! Go as far as you can before you wipe out on the longest wave ever discovered. 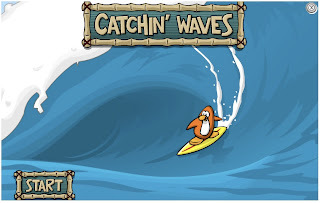 Catichin' Waves is the best game on Club Penguin. Don't you think? 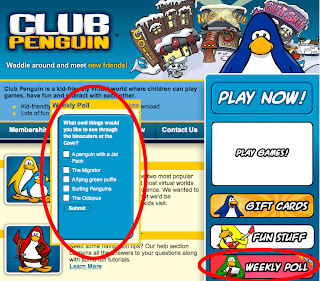 Clubpenguin.com has a cool new poll on it's home page. Try it out! Make your vote count. I wonder if anyone has cheats for the poll yet. Rest easy, penguins. Sony decided not to buy ClubPenguin.com. The price was too high at over $500 million. But appearently, there is still another buyer looking at our favorite game site. Here's a question. 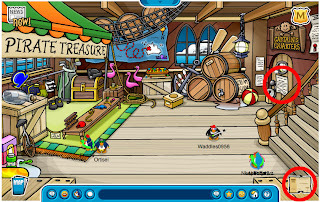 Do you think if Club Penguin is sold, will the new buyers allow coin cheats? As anyone seen this Penguin? 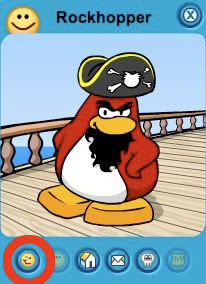 We've seen Rockhopper recently in the Forest. If you see him click on him, then click on the winking icon in the lower right. When you do, you will get a free eye patch! If you've seen him, let us know. Did you know the a rockhopper is a type of penguin? The rockhopper penguin is related to the macaroni penguin. Seriously! 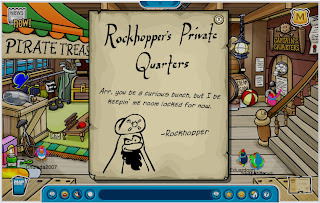 Click here for more rockhopper information. Pudding82 has been shut down! Well, it didn't take us long to get the site of a cheat shut down. She is no longer in business. Thanks for all your help. We will continue to watch for those stealers and cheats out there stealing our posts. Thanks for visiting. 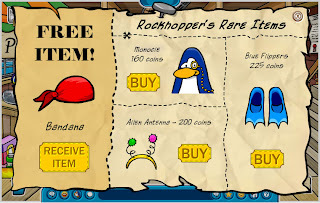 Rockhopper is back and he's got new rare items! Step 1. Go the The Beach. Step 2. Hop aboard Rockhopper's ship "Migrator." Step 3. Enter the "Store" double doors on the ship. Step 4. Click on the paper in the lower right. EXTRA CHEAT: Click on the door in the upper right to get a secret message. SECRET: Find the new Club Penguin Pin today! Here is how to find the new Club Penguin secret pin released June 22nd. Step 4. Look behind the green chair in the lower right. 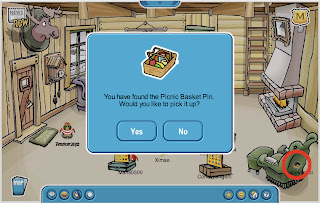 NOW YOU'VE FOUND THE CLUB PENGUIN SECRET PICNIC BASKET PIN! A picnic basket in a ski lodge? Step 4. 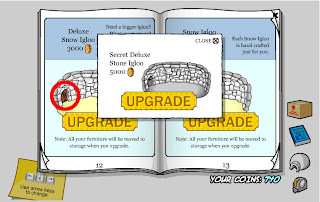 Click on page 5 of the "Igloo Upgrade" magazine. Help us stop a THIEF! Pudding82, that's you! It has come to our attention that "pudding82" has OUR exact posts on her web site. 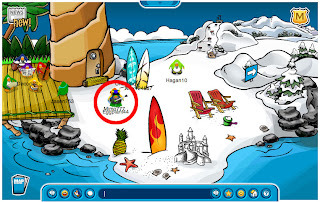 All you faithful Club Penguin Gang readers, please let her know this is not right! Please ask her to remove all of our posts. Help us stop a cheat! Go here and leave a comment now! After you do, please leave a comment here too and let us know and we will acknowledge all Penguins that help us. She has also stole from http://winkie4.wordpress.com/2007/06/17/hate-team-gone-but-now-pudding-82/#comment-489. She took his very long "Guide to Club Penguin." Sad, very sad. Pudding82 claims she is starting another site where she will be stealing again. 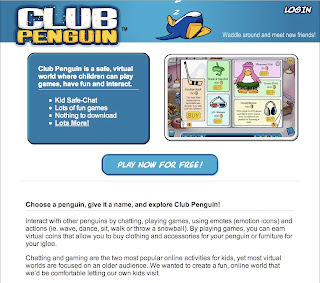 Check this out: The very FIRST Club Penguin site! 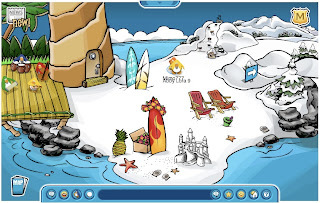 This was the very first home page of Club Penguin. It was October 26, 2005. How cool is that? 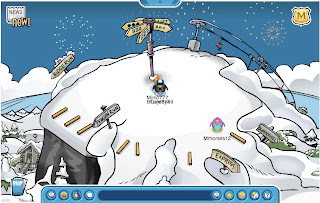 Was anyone playing Club Penguin way back then? Does anyone know how or where we got this? 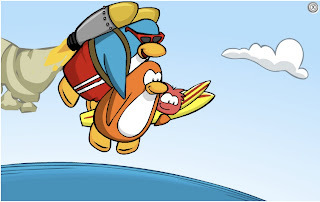 SECRET: Get your Puffle to Surf! 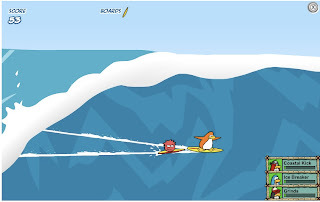 Did you know that your Puffle knows how to surf? Step 1. First you need a red Puffle. Step 2. Walk him to the Catching Waves game in the Cove. Step 3. Now play the game. 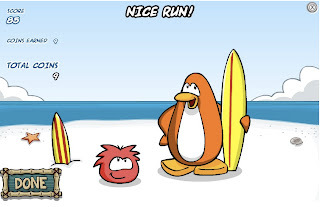 Now you and your Red Puffle are surfing! My Red Puffle's name is Hairy Henry. SECRET: Secret Delux Stone Igloo! Step 4. 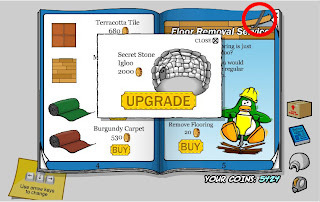 Click on page 12 of the "Igloo Upgrade" magazine. Step 5. 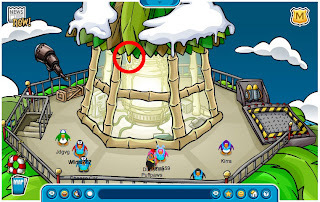 Click on the door of the Delux Snow Igloo circled in red above. They hide it, we find it. Did you? 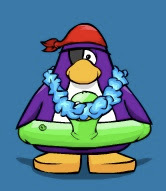 Find the new Club Penguin green Sunglasses! Here's how to find the new Club Penguin green Sunglasses. Step 1. Click on the Map icon. Step 2. Click on the "Town." Step 3. Go into the "Nightclub." Step 4. Move to the back and now take a pair! We look so cool in sunglasses. Do you? 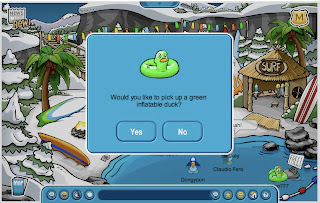 Here's how to find the Club Penguin Green Inflatable Duck. Step 2. Click on the "Cove." Step 3. Click on the green inflatable duck in the water. It makes you swim weird doesn't it? 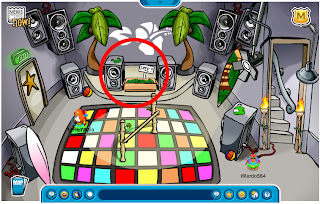 Here's how you find the Club Penguin Flower Headdress. Step 2. Go to the "Beach." Step 3. Click on the baox of headdresses next to the surf board. TRICK: Sit in any direction! Did you know that you can sit your penguin in any direction, not just four? Step 1. Move your Club Penguin in the direction you want to sit. Step 2. Now press the "s" key on your keyboard. Amaze your friends. Impress your parents (not really). Has another Club Penguin ever been blocking a pin or item that you've wanted? Now there's a way to walk on them without having them move. Here's how. Step 1. Hold down the "Tab" key on your keyboard. Step 2. Click on another penguin. As you can see in the picture, you can be right on top of another penguin. Or are you under them? 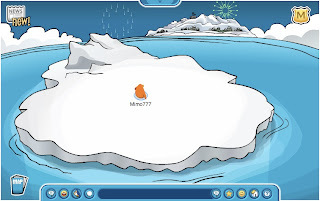 Check out our new site called "Rate My Penguin." You can post your Penguin and have others rate it. Find the newest Club Penguin pin! Here's how to find the newest Club Penguin Pin. Step 2. Go to the Beach. Step 3. Go into the Beacon. Step 4. Click, "To Top" or top of light house. Step 5. Click on the yellow surf board in the palm leaves. See pic above. Now you have the newest pin. Don't you just dig the new surf game? Get the new Club Penguin Ice Cream Apron! Here is how to find the new Club Penguin Ice Cream Apron. Step 1. Go to the Map. Step 2. Click on the Forest. Step 3. See the picture above to find the apron. Above are the documented Quick Keys. 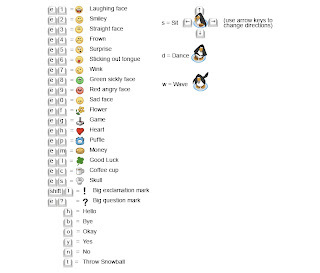 Here are a few Club Penguin secret Quick keys. Are there anymore secret Quick Keys? You can make two penguins say, "hello" on the banner of the home page. Step 2. Click on the "Contact Us" button. Step 3. Click on the door of the Gift Shop in the banner. Step 4. Then quickly click on the door of the Coffee Shop. The green penguin and the blue penguin will meet and say, "hello." Have you tried the new game yet? It's called "Catchin' Waves." Step 2. Click on the Cove. Step 3. 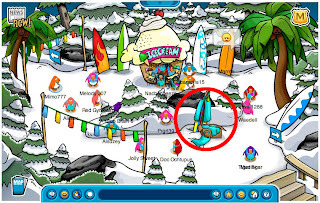 Click on the "Surf" hut. HINT: Push "8" to do a handstand. If you know any cool tricks, post them here. The new Viking Helmets discovered. Step 3. Go to about page 5 where you see the "Floppy Hat" and the "Trendy Sunglasses"
Step 4. Click between these to things to find the red Viking Helmet. Step 5. 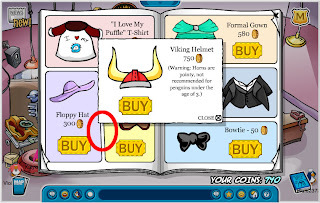 Click Close and then between the two items 3 more times to find the Blue Viking Helmet. 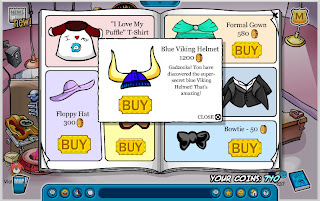 YOU HAVE NOW FOUND THE CLUB PENGUIN SECRET RED AND BLUE VIKING HELMETS! The new Viking Helmet... coming tomorrow! If you know where it is post it now to get credit. Step 3. Go to about page 7 where you see the "Marching Band Hat." Step 4. Click on the feather on the band hat. 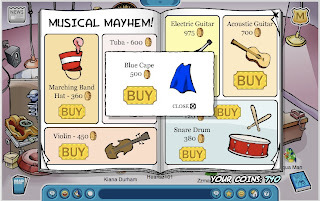 YOU HAVE NOW FOUND THE CLUB PENGUIN SECRET BLUE CAPE! Find the new Club Penguin Headphones! Step 3. Go to about page 11 where you see the "Festive Sombrero." Step 4. Click on the "Festive Sombrero." 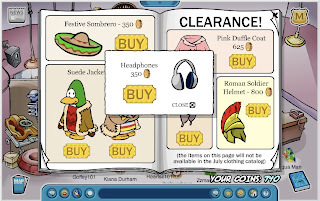 YOU HAVE NOW FOUND THE CLUB PENGUIN HEADPHONES! Find the new secret Divers Helmet! 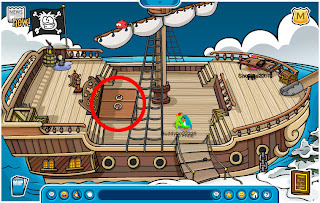 Here is how to find the Club Penguin Divers Helmet. Step 2. Click on the magazine icon in the lower right called, "Penguin Style June '07." Step 3. Go to about page 3 where you see the "Newspaper Hat." Step 4. Click on the Newspaper Hat. 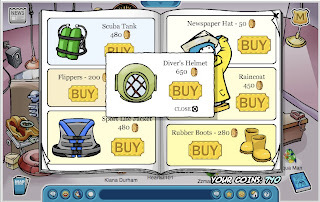 YOU HAVE NOW FOUND THE CLUB PENGUIN DIVERS HELMET! Can you go under water with this?